These are proteins that constitute the building materials in living organisms. Major types of fibrous proteins that act as structural elements include actin and myosin of muscles and other contractile systems, collagens that form connective ligaments within the body, keratins that form protective coverings such as skin, hair, hooves, horns, feathers, and others. These are the proteins that regulate the numerous processes and activities for the organism. They include enzymes that modulate chemical reactions, antibodies that provide immunity against infection, hormones, and various other substances that make each life form respond appropriately to the constantly changing internal and external environments. There is one common plan of construction for the thousands of types of proteins found in living systems. The 20 kinds of naturally-occurring amino acid monomers are joined together in unbranched, linear polymer chains of proteins. All 20 amino acids have the same basic structure. There is a carboxyl group, COOH, and an amino group, NH2, joined to the first (α-carbon) atom. and a hydrogen atom as a third unit bonded to this carbon in all amino acids. Glycine, however, has a second hydrogen atom joined to the α-carbon. The other 19 amino acids also have a fourth group (R) which differs from one amino acid to the other. In the presence of the appropriate enzymes, amino acids are joined together in a dehydration reaction by peptide bonds, creating polypeptide polymers which form the protein. The differences between proteins are due to the differences in the numbers, kinds, and arrangements of amino acids in polymers. It is also attributed to the number of polymers that form the protein, alongside the weak hydrogen bonds that give the protein molecule its special shape. Protein synthesis is a very complicated process and it includes the interaction of different kinds of molecules. The most important ones are RNA. The transcription of DNA into RNA begins when the enzyme RNA polymerase binds to a sequence of nucleotides on the DNA, called the promoter. Next, the two strands of DNA are separated, and one strand serves as a template for the formation of a complementary strand of RNA. RNA polymerase moves along the DNA and joins the complementary nucleotides to the growing RNA strand one by one. The enzyme only works in the 3`to the 5`direction on its DNA template, assembling RNA in the 5`to 3`direction. This process is much like the replication of DNA with one important difference: DNA replication, once begun, usually copies the entire DNA in the cell, whereas RNA synthesis transcribes only selected portions of the DNA. Since DNA molecules are double-stranded, any section of DNA could, in principle, be transcribed into the different RNA molecules, one complementary to each strand. In practice, only one of the strands is transcribed in any one segment of DNA. The orientation of the promoter indicates which strand is to be transcribed. At the beginning of each mRNA is a ribosome binding site: a sequence of nucleotides that binds to a ribosome in such a way that the first codon (AUG) is positioned correctly for translation, and the last codon (the stop codon) may be one of three codons: UAA, UAG and UGA. At the other end of an mRNA molecule, there is a polyadenine (ploy-A) tail composed of up to 200 adenine residues. It appears that this tail protects mRNA from breakdown by the enzymes found in the cytoplasm. Ribosomes, the organelles of protein synthesis, consist of several types of rRNA and about 70 kinds of polypeptides. In eukaryotes, the production of ribosomes takes place in an area of the nucleus called the nucleolus, where several hundred thousands of ribosomes are produced per hour. Such rapid production is possible only because a eukaryotic cell’s DNA contains up to 600 copies of the ribosomal-RNA genes from which rRNA is transcribed. There are four different kinds of rRNA that participate with the protein in ribosome structure. A functional ribosome consists of two subunits, one large and one small. When not engaged in protein synthesis, the subunits separate and move around independently. Each may join to a different subunit of the opposite type the next time they participate in protein synthesis. In eukaryotes, the polypeptides of ribosomes are made in the cytoplasm and then pass through the nuclear envelope and enter the nucleolus, where the rRNA and polypeptides are assembled into ribosomal subunits. During protein synthesis, interaction occurs between mRNA and rRNA. The third kind of RNA that participates in protein synthesis is transfer RNA (tRNA), which carries amino acids to the ribosomes. For each kind of amino acid, there is a specific kind of tRNA molecule that will recognize and transport it. (Amino acids, for which there are several different codons, have more than one distinct kind of tRNA). Transfer RNA is transcribed from tRNA genes, often arranged in clusters of seven or eight tRNA genes in the same part of the DNA molecule. All tRNA molecules have the same general shape. Parts of the molecule fold back in characteristic loops, which are held in shape by base pairing between different areas of the molecule. There are two sites on a tRNA molecule that are important in protein synthesis. The first site is where the amino acid is attached to the molecule. This site consists of the three bases (CCA) at the 3`end of the molecule. The other site is the anticodon site, which base-pairs with the appropriate mRNA codon at the mRNA ribosome complex. This temporarily binds the tRNA to the mRNA, allowing the amino acid carried by the tRNA to be incorporated into the polypeptide in its proper place. Protein synthesis starts when the mRNA binds to a small ribosomal subunit and the first codon (AUG) is positioned correctly for the initiation. The AUG codon then base-pairs with the anticodon of tRNA carrying methionine. This methionine eventually becomes the first amino acid in the polypeptide chain. Then, a large ribosomal subunit binds to the complex, and the reaction of protein synthesis can begin. A ribosome has two sites where tRNA can bind. 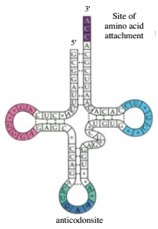 As a result of the events outlined above, the initiation codon (AUG) on the mRNA molecule is positioned at the first of these sites on the ribosome: the Peptidyl (P) site. The mRNA codon for the second amino acid is lined up with the second site: the aminoacyl site. From this point, the polypeptide chain elongates through a cycle of three steps. 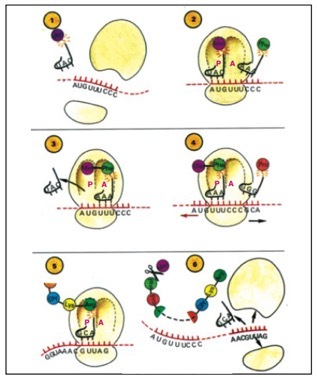 The first step is the binding of the next tRNA to an anticodon, complementary to the next mRNA codon. The amino acid carried by this tRNA will be the next amino acid in the polypeptide chain. The second step is the peptidyl transferase reaction, which results in the peptide bond formation. The peptidyl transferase enzyme, which catalyzes the reaction, is an integral part of the large ribosomal unit. This enzyme attaches the first amino acid to the second one by a peptide bond so that the first tRNA is now empty and the second is holding both amino acids. The third step in the cycle moves the ribosome along mRNA. This brings the next codon to the ribosome’s P site, and the cycle starts over again as the anticodon of the appropriate tRNA binds to the codon, bringing the third amino acid into position at the A site. The growing polypeptide chain is attached to the newly arrived amino acid on this third tRNA and the sequence repeats. Protein synthesis stops when the ribosome reaches a stop codon on the mRNA. A special protein, called a releasing factor, binds to the stop codon and causes the mRNA to leave the ribosome. The ribosomal subunits separate, as the 5`end of the mRNA emerges from the ribosome, and it may bind to another small ribosomal subunit which initiates protein synthesis again. Each mRNA molecule typically has over 100 ribosomes attached to it and transcribing its message as they move along. One mRNA with many ribosomes attached to it forms a cluster called a polyribosome or polysome.